COUNT ME IN! How many vegans in the UK? Up to £60 donation to the Vegan Society when you switch to Ecotricity* We’re an energy company unlike any other – we take the money our customers spend on their electricity and gas bills and use it to build new sources of renewable energy, such as windmills. People:Power is at the heart of what we do – the more people who join us, the more sources of green energy we can build. Join us and we’ll donate up to £60 to the Vegan Society* – it couldn’t be easier to switch and takes less than five minutes. Call us free on 03000 302 302 (quoting VEGAN1) or visit www.ecotricity.co.uk/vegan-society Terms and conditions *For full terms and conditions, please go to www.ecotricity.co.uk/vegan-society. **Our ethical pricing means all customers pay the latest, best price, no matter when they joined and regardless of how they pay. You can see our latest fuel mix at www.ecotricity.co.uk/our-fuel-mix. We hope you’ll never need to, but if you’d like to make a complaint or would like to see our complaints procedure, please visit www.ecotricity.co.uk/complaints or call us on 0845 555 7 100.
he start of a new year is the perfect time to consider the adventures we want to have over the next twelve months. Travelling as a vegan automatically gives you purpose. Sniffing out the best cafes and restaurants to find local vegan fare is always exciting, as is finding ways to observe wildlife in their natural habitat, discovering animal sanctuaries and local vegan-friendly causes and companies, and the possibility of making international vegan friends. for Faustine Ladeiro’s top three vegan-friendly UK getaways (page 24), and hear from an ex-farmanimal carer on the rise of sanctuaries as a vegan travel destination in The highlight of your holiday (page 22). You may have noticed that this issue is reaching you one month earlier than usual. We are now operating on a new magazine timetable to ensure a three-month gap between each issue. Look out for copies on your doorsteps at the end of January, April, July and October. Happy travelling! Print kingsdown.uk.com Submissions We welcome articles on a range of topics relating to veganism, as well as photographs, images, and illustrations. Please email editor@vegansociety.com for more information. Staff Chief Executive Officer Jasmijn de Boo Head of Communications Peter Smith Head of Business Development George Gill Head of Campaigns & Policy Heather Graham Chief Finance Officer Stephen Hirst Senior Advocacy & Policy Officer Amanda Baker Senior Campaigner Andrea Speranza Volunteering & Engagement Manager Alex Douglas Media & PR Manager Jimmy Pierce Office Manager & Fundraiser Sarah Cook Merchandise & Sales Manager Spencer Harris Finance Officer Allan Oakes Web & Digital Communications Officer Ali Ryland Communications & Campaigns Officer Elena Orde Trademark Relations Officer Abigail Stevens Business Development Officers Paul Philbrow & Laura Faliveno Business Development Assistants Sally Murray-Fella, Rhiannon Delo, Jo Connop, Dean Bracher Research Officers Dr Terri Holloway, Dr Lorna MarquesBrocksopp Supporter Services Officer Andy Davidson Supporter Services Assistant Debbie Latham Council Edward Daniel (Chair) Stephen Walsh (Vice-Chair) Ruth Jenkins (Treasurer) Menna Jones (Assistant Treasurer) Jenifer Vinell, Paul Crouch, Alex Kapila, Sagar Shah, Felix Hnat, Constantin Imbs The views expressed in The Vegan do not necessarily reflect those of the Editor or of The Vegan Society Council. Nothing printed should be construed to be The Vegan Society's policy unless so stated. The society accepts no liability for any matter in the magazine. The acceptance of advertisements (including inserts) does not imply endorsement. inter has been a very busy and productive time for all staff and volunteers at The Vegan Society. We had two top months of media coverage (66 pieces across print, online, radio and TV). We have now successfully established ourselves as the go-to organisation for commentary on vegan-related issues, and continued to generate our own timely and engaging content. We also piloted a hospital catering and nutrition workshop, which was well received and will be extended in 2016, bringing reliable information on affordable vegan nutrition to all involved in the hospital catering service. We launched several other projects, details of which you can find in this issue. We celebrated the 25th anniversary of the Vegan Trademark with a parliamentary reception hosted by the new vegan MP Christina Rees. This included two fascinating presentations from Alpro and LUSH, as well as very generously donated bespoke cupcakes from Melissa Morgan, AKA Ms Cupcake. I spoke about veganism at a university, as well as the Sustainable Cosmetics Summit in Paris. I also gave a speech, alongside our ambassador Fiona Oakes, at a World Vegan Day Extravaganza, which was hosted at Karamel Cafe Bar. A wonderful way to start off the celebrations! We were delighted to receive two very generous anonymous donations in November. In one case, a new vegan loved our work and was keen to offer their support in a very tangible way. The numbers all seem to be going in our favour, as: • Membership has increased by over 50% in just three years • The Vegan Pledge now attracts over 1,000 people a month, most of whom plan to stay vegan • Trademark-registered products approach 20,000 globally. We are looking forward to a very effective 2016, and we thank all of you for your continued support. Staff Updates We were delighted that in October, Spencer Harris returned to The Vegan Society as Merchandise and Sales Manager. As one of our longest-standing staff members, he was greatly missed. We wish him the best of luck in his new role. We would like to thank Jess Olley for her temporary assistance in the membership department for several months. Jess has helped us to keep on top of our new membership applications, and her helpful and friendly personality has been much appreciated. Achievements Parliamentary reception celebrations On 17 November The Vegan Society hosted a parliamentary reception in Westminster, sponsored by vegan MP Christina Rees. The event celebrated the 25th anniversary of the Vegan Trademark, and the success of vegan business. Journalists and MPs, as well as their researchers and advisers, met to hear of the rapid growth of the vegan market. Success stories were heard with talks from leading figures in the industry. Alpro’s Sue Garfitt detailed the company’s meteoric rise in the nondairy sector, and spoke about the next vegan products Alpro could be bringing to the market. LUSH’s Hilary Jones regaled guests with a fascinating history of the company and the importance it places on ethics. She also paid tribute to the Vegan Trademark as integral to LUSH’s business, while also emphasising the value of the under-acknowledged “vegan pound”. As well as discussing the boost vegan businesses bring to the UK economy, the widerranging implications were also recognised. The positive impact of vegan business on public health and the environment were discussed, as well as the inclusive nature of vegan food. Our parliamentary reception was an unequivocal success, helped along by Ms Cupcake’s generous (and delicious) donation. West Midlands vegan weekend This year, West Midlands Vegan Festival expanded to cover the full weekend – a marker of the growth and success of vegan events. The decision to expand was a resounding triumph, as Wolverhampton Civic Hall was packed with visitors and stallholders from the get-go. The Vegan Society managed an outreach stall and a food sampling stall, where visitors could compare samples of vegan products, including cheese, chocolate and flavoured milk. We partnered with many of our Trademark Holders, including Vegusto, Pana Chocolate and Rebel Kitchen, to introduce people to products they may not have tried. Many visitors were transitioning towards veganism, and said that this would be easier for them now they had identified some tasty vegan substitutes for their old favourites. Vegan Society Nutritionist Dr Terri Holloway gave two talks on vegan nutrition, which proved very popular. Terri educated listeners on the basics of healthy vegan living, and reinforced the importance of including reliable sources of vitamin B12 in your diet. Vegan labelling in Luxembourg As the EU explores whether to regulate vegan food labelling, The Vegan Society’s Senior Advocacy Officer Amanda Baker has been working to positively influence these labelling laws. During World Vegan Month, Amanda attended a meeting in Luxembourg, which currently holds the presidency of the Council of the EU. This meeting included Claude Turmes MEP and the EU Working Group, which The Vegan Society leads. Amanda presented the Vegan Trademark as the leading vegan labelling standard in the EU and beyond. Claude Turmes MEP actively supports our work to achieve robust EU vegan food labelling, to benefit humans, non-humans and our planet. Claude Turmes named the SAFE Vegan Working Group a ‘Climate Hero’ for vegan outreach on sustainable living. SAFE will proudly display our Climate Hero certificate! Record-breaking Pledgers A swathe of the vegan-curious joined our Pledge in the last days of October ready for World Vegan Month on 1 November, while more joined during the month. Between October and November we had the largest number of Pledgers to date: 2258! Help this month be a similar success by suggesting your friends and family take the Pledge today: vegansociety.com/pledge. Achievements Forest Green Rovers go vegan Forest Green Rovers are now the first fully vegan football club in history, after The Vegan Society advised on the practicalities of making their dream a reality. On the day before World Vegan Day, The Vegan Society proudly attended the club’s first 100 percent vegan game as guests of honour. Rovers have gone vegan over a four year period. They first removed red meat from their menu, before going vegetarian and then almost vegan last season. Throughout September and October, The Vegan Society were consulted and duly helped the club replace their final few nonvegan products. We suggested various Vegan Trademarked products, a non-dairy milk taste test and much more. Our recommendations were gratefully received. The day itself was an unequivocal success, and a glorious celebration of vegan fare. Rovers won 2-1 and remain well on course for their first ever promotion to the Football League. Head of Communications Peter Smith rounded off the celebrations by officially awarding the player of the match award to Rovers’ defender James Jennings. The club’s permanent switch to a wholly plantbased menu did not go unnoticed by the press. Sky Sports News produced a feature on the food and drink offerings, while the BBC, ITV and CNN among others also reported the story. We look forward to continuing our excellent relationship with the club and its owner Dale Vince, founder of Ecotricity. Here’s to a great season and (fingers crossed) a promotion party come the end of the season in May! Record numbers of new members The Vegan Society has been delighted to welcome a huge influx of new members this season. Each event that has been attended by Vegan Society staff has been flooded by a record number of visitors keen to sign up and to support our work. This is vital for us as an organisation to increase our influence – the more of us there are, the bigger the impact we can make on policy and decision-makers to create a more vegan world for everyone. Welcome to any first-time readers of The Vegan – please do write in with your comments, suggestions and letters to editor@vegansociety.com. Vegan cosmetics – kind and sustainable! From 21 to 23 October, staff represented the society at the Sustainable Cosmetics Summit in Paris. We contributed to important discussions about ethical ingredients, and the similarities and differences between vegan and eco-labels. Participants learned about the value of ethical labelling for companies who want to be consumer-oriented and give themselves a political voice. It is also useful for companies to differentiate themselves from ‘green-washers’ – companies who spend more time and effort proclaiming that they are good for the environment than they do implementing business practices that minimise environmental impact. ‘Green’ is now a beauty buzzword, and indicators show that beauty bloggers are now focusing on high-quality ethical products. CEO Jasmijn de Boo gave a presentation on the benefits of vegan labelling for both companies and consumers, as well as the animals and the environment. Jasmijn also talked through the non-vegan ingredients commonly used in cosmetics. This is a useful point as there is still confusion over whether ingredients such as honey and shellac are suitable for vegans, illustrated by the fact that The Vegan Society’s Trademark team is regularly approached by cosmetics companies seeking to register products which contain these ingredients. CEO Jasmijn de Boo was interviewed live on Sky News about the World Health Organisation report which classified processed meat as a carcinogen, on a par with tobacco. To a worldwide audience, Jasmijn spoke of the benefits of veganism in a five-minute piece shown multiple times. Our separate written quotes were used in over 20 news stories spanning seven different countries – UK, France, Belgium, Portugal, Brazil, Chile and Colombia, demonstrating our widening global reach. On the same day, Media Manager Jimmy Pierce appeared on BBC Radio West Midlands to discuss the report’s findings and make the case for veganism. • The write-up of our parliamentary reception featured in six publications including Global Business and Finance, Food & Drink International Forum and Better Retailing magazine. • Ahead of the UN Climate Change Conference, we wrote an opinion piece calling for a plant-based solution to climate change: our Grow Green campaign. It was published in two regional daily newspapers, three environmental websites and The London Economic. • Quotes from Researcher Dr Terri Holloway gave some much-needed balance to an article in The Sunday Times about an isolated instance of a malnourished vegan teen. • Jimmy appeared on BBC Radio Scotland, speaking to Kaye Adams about the Chatham House report which called for a ‘meat tax’ to curb climate change. Jimmy revealed his favourite recipes and was dubbed, rather dubiously, ‘Nigella’. • Jasmijn de Boo’s recent Huffington Post blog, which compared the climate impact of being vegan with the 5p carrier bag charge, became her most widely read yet. • To celebrate World Vegan Day, Elena Orde wrote an excellent piece which made Female First, Nutrition Rocks and Donegal Now. • We were quoted in The Daily Mail celebrating Guinness going vegan, and also in The Independent’s sister newspaper, the i, in a story about Glasgow’s burgeoning vegan scene. ive years ago, Kristin Lajeunesse embarked on the trip of a lifetime. Quitting her job, selling her possessions and moving into a van, Kristin set out to travel the USA and eat in every all-vegan establishment. Several years – and over 500 restaurants – later, and she’s still on the move. On culinary tourism We’ve all been there, right? Sitting down to plan an upcoming adventure – it might be for work or for leisure – but there is one thing we all share, one thing we must do before even booking the flight: find the nearest vegan eats. I’d go so far as to say it’s become a running joke within the vegan community, how we plan our travels around vegan food options. I even went so far as to spend a full two years travelling specifically for vegan food! After making the decision to move to a completely vegan lifestyle I, like many others, soon fell head-over-heels in love with food. It wasn’t just the palate pleasures though, as I soon found myself just as thrilled with the visual aspect; taking pictures of my food and sharing them with other vegans, with non-vegans, and with anyone who queries, “What do you actually eat?” We vegans love that we can enjoy food without cruelty, and this is something that we can connect over. Tips for the vegan traveller • If you’re on Facebook, look for a local vegan group to join, for example, “Vegans of Berlin.” You can post about your travel plans, ask questions about where to eat and/or find anyone who might want to meet up. • Grab a copy of the Vegan Passport. It contains easy-to-flip-to keywords designed to help convey your vegan needs, in 74 languages. • Keep track of your plans by making notes. I do this to keep track of restaurants I want to visit, transportation methods, landmarks etc. • Finally, my three favourite apps for finding nearby vegan eats are More Than Salad, Yelp! and Happy Cow. An unlikely story from the road The following is an excerpt from Will Travel for Vegan Food: A Young Woman’s Solo VanDwelling Mission to Break Free, Find Food, and Make Love. My mom flew into Missoula Montana to join me for a week of my journey. The following scene takes place at Omar’s Rawtopia in Salt Lake City, Utah. Mom and I had just finished a meal with a local couple who had reached out to me early in my travels, suggesting we get together when I arrived in town. Directions Mix the flour with the sugar and salt in a bowl. Mix the warm soy milk with the yeast and leave to stand for a few minutes. Pour it onto the flour and mix in with a spoon. Mix in the oil. Knead well for 5-10 minutes by hand, folding the dough over and over itself. The idea is to incorporate as much air as possible into the dough. The dough should be supple and smooth, and not sticky. Leave to rise in a bowl covered with a clean tea towel for 1 hour, ideally at 25°C. Knead again for 1 minute and add the chocolate chips and the orange peel. Knead again to incorporate them well. Shape the dough as desired: for a classic brioche, shape the dough into medium-sized balls and place side by side in a loaf tin or spring form cake tin. Leave to rise for 2 hours in a turned-off oven with the door closed. Brush with soy milk and bake for about 30 minutes at 180° (Gas mark 4). Keep the brioche wrapped in a tea towel as it tends to dry out quickly. of some of the most exciting food cultures from around the world. Made of the ﬁnest ingredients without using artiﬁcial additives, colourings or preservatives while at the same time respecting local food traditions. Clearspring always works directly with their producers to build long term partnerships of ethical trade that support sustainable organic farming and beneﬁt local communities. “Enjoy the great taste of good food”. All of our products are dairy, reﬁned sugar and GM free and a good selection are gluten, wheat and nut free. ason Gillespie, one of the most decorated Australian fast bowlers of the modern era, last year joined compatriot Peter Siddle in going entirely plant-based. In doing so he became the first vegan in English cricket. An accepting community In the four years since taking over as the coach of Yorkshire, then of the second division, Jason guided his county to promotion then successive Division One championships; remarkable feats giving rise to speculation he would get the England job. Indeed, he was the bookmakers’ favourite before current coach Trevor Bayliss took the post. But Jason could hardly be happier at the Leedsbased club which, much like the wider cricketing fraternity, has accepted Jason’s new lifestyle without exception. “I’ve been overwhelmed by people’s desire to help and cater for my vegan diet. Everyone’s been so respectful, understanding and incredibly supportive. Do people have a different experience to the one they expect? Visitors often tell us they were surprised to see the various species of animals together, coexisting harmoniously. At most sanctuaries, they are separated into different paddocks. Most people don’t expect goats, deer, pigs, and donkeys to follow them along on the tour the way dogs would do. They are amazed to see full-grown goats sitting on my lap like big babies. They are also surprised at the beauty of the grounds and ocean views. It rains enough to keep the plants and pastures bright shades of green and there are colourful flowers everywhere. Recently, a non-vegan couple came to visit and were so inspired, they decided to go vegan overnight. This is the best news people can give us because it affirms that we are fulfilling our mission. Does it get any better than cuddling goats for a living? ANIMAL FRIENDLY FOOTWEAR Over 100 mens and womens styles including: Casual, Formal, Sport, Leisure, Work, Hiking, Dress, Fashion, Sandals, Belts and Accessories. Made in England and Europe with quality ‘breathable’ non-leather materials. A TREAT FOR YOUR FEET IF YOU DON’T EAT MEAT! othing beats finding a restaurant that serves fantastic vegan food in a foreign destination – nothing apart from finding the same restaurant in a city only an hour’s train journey away, that is. There’s so much to be said for travelling locally, from saving money on plane tickets and gas emissions to expanding your options for weekend breaks. The UK is home to some of the most veganfriendly cities in Europe – and we’re not even talking about London! Here are some of our favourite destinations to enjoy good vegan food and cosy lodgings. Glasgow In 2013, Glasgow was named the most veganfriendly city in the UK. Home to half a dozen 100 percent vegan restaurants and over ten other establishments all offering great vegan options, it places top of the list for any vegan travelling to Scotland. Mono, a few minutes’ walk from St Andrews Cathedral, is a cafe, bar, restaurant, music venue and record store. A fresh, tasty vegan menu, as well as year-round musical entertainment, has made this little place so popular it is packed every night – booking in advance is advised. The Centre for Contemporary Arts (CCA) is the beating heart of Glasgow’s creative scene. The centre curates fantastic exhibitions and is also a performance space presenting the best of Scottish art. Stop for a pre-theatre meal or relaxed Sunday brunch at Saramago Cafe Bar, the Centre’s exclusively vegan restaurant. They serve an impressive range of teas and fresh homebaked bread, and their menu is so extensive it’s almost impossible to decide on a meal. Dishes vary from haggis fritters to breakfast burritos – just make sure to leave some room for dessert! Quirky, cool and endlessly entertaining, Brighton is home to Brighton Fringe, VegFest UK (returns 27 and 28 February – do not miss it), Brighton Fashion Week and many other festivals throughout the year. If you come down during the summer, be sure to attend Brighton Pride, one of the best LGBT pride festivals in the UK. Take a walk through the Pavilion Gardens, then head to Gardner Street for a bit of shopping at Vegetarian Shoes’ flagship store. All their products have been made with 100 percent vegan leather since 1990 and the owner, Robin Webb, now sources the shoes exclusively from British and European factories. Spend your lunch break at Loving Hut, an international vegan fast food chain with branches all the way to Vietnam. Grab a seat and tuck into some of the best vegan ‘duck’ around before exploring the city – why not go on a bike tour and learn about the history of Brighton? Maybe go to VBites Cafe – a proud holder of the Vegan Trademark, the brand is already famous for their meat substitutes. The hottie dog and fish-style wrap are particularly tasty. Buy Online New Books Plum by Makini Howell (Hardback) RRP £20.00 – Our price £13.99 Plum Bistro, Seattle’s wildly popular vegan restaurant, is known for its delicious and innovative vegan recipes using local ingredients. Sure to please both vegans and non-vegans, this photo-filled cookbook features Plum’s flavourful, comforting dishes for brunch, soups, salads, entrées, desserts, and more. Gluten-Free & Vegan Bread by Jennifer Katzinger (Paperback) RRP £16.99 – Our price £11.99 Jennifer Katzinger makes the tricky task of baking artisan gluten-free and vegan breads at home simple. This cookbook contains recipes for yeasted breads, fougasse, flatbreads, sweet breads, sourdough, quick breads, savoury breads and sandwich breads. Gluten-Free & Vegan Pie by Jennifer Katzinger (Paperback) RRP £16.99 – Our price £11.99 Home-baked pie, fresh from the oven … who doesn’t love it? Here you’ll find techniques and tips for mixing and working with dough that doesn’t contain butter or lard, and for luscious fillings that contain neither cream nor egg. Super Seeds by Kim Lutz (Paperback) RRP £9.99 – Our price £7.99 Five super seeds covered in one super volume! Chia, hemp, flax, quinoa, and amaranth are tiny powerhouses that deliver whopping amounts of protein, essential fatty acids and great taste in every serving. Perfect for vegan, vegetarian, and gluten-free diets, they each get to take a star turn in these 75 mouth-watering recipes. Vegan Street Food by Jackie Kearney (Hardback) RRP £16.99 – Our price £12.99 Jackie Kearney, MasterChef finalist in 2011, has brought her two lifelong passions, travel and vegan food, together in a stunning new book. Jackie and her family ate their way around Asia, sampling street food and jotting menu ideas on the back of napkins. Inspired by the food cultures she embraced on her travels, Jackie has brought new life to healthy, meat- and dairy-free food, inspired by the sheer quantity of vegan food on offer in Asia. Offer Buy any of these books between 1 February and 30 April and receive 10% off by simply entering the code SPRINGBOOKS2016 at checkout. Please note that this offer only applies to purchases made through vegansociety.com/shop. 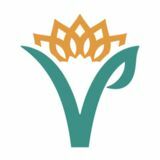 Discount List	The Vegan Society’s Discount List is a network of vegan and vegan-friendly businesses who offer a discount to The Vegan Society members and The Vegan subscribers. Over the coming months new businesses will be joining us, so check back regularly to see the latest offers available to you. Your Vegan Society membership or The Vegan subscription already entitles you to 10% off at Holland and Barrett and further discounts at over 70 companies. For full details on discounts and our complete list of participating businesses, please visit us online at vegansociety.com/resources/discount-list. Our newest participants include: • New Grounds Food – Health food company specialising in energy bars • Raw Halo – Raw chocolate bars • Aqua Natural – 100 percent natural sugaring hair remover • Gaia Creams – Raw skin food made to order • B Neill Hypnotherapy – Help with healthy eating and weight loss • Loveletter Cakeshop – Boutique bakery specialising in custom designed wedding cakes • Ecolade – Eco-friendly and vegan handbags • The Vegan Punk Website Marketing – A variety of helpful services to create and improve your website • Farplace Animal Rescue Vegan Charity Shops – Animal rescue charity with three vegan charity shops • The Garden Shed Cafe – Small, quirky cafe serving good karma comfort food • Swami Health Foods Ltd – Health food shop based in Middlesex • Vegetology – Effective nutritional solutions, providing Vitamin D supplements and more • Chasing Change – Ethical advertisement agency • Vegan Hippo – Vegan cafe based in the heart of London • DYFI Wholefoods – Wholefoods shop based in Machynlleth, Wales • El Buda Profano – gan sushi bar based in Peru • On the Eighth Day Co-operative Ltd – Health food store and cafe in Manchester • Raw Passion – 100 percent organic vegan ethical skin food • Imhannahchloe.com – E-books from a YouTuber promoting a healthy vegan diet and lifestyle Do you have a great vegan-friendly business near you? Why not ask them to join the discount list? They can find out more at vegansociety.com/yourbusiness/discount-list or email us on discount@vegansociety.com. Active Vegans Alex Douglas, Volunteering & Engagement Manager I hope you all had a great World Vegan Month and celebrated in style! I’m a keen tourist, and usually spend World Vegan Day exploring brilliant new vegan cities and cafes. Last year I was travelling in the States, and spent 1 November in Chicago, eating some of the best vegan food there is. Veganism is definitely on the rise, with the demand for vegan food being met at all corners of the world! Let me know how you enjoyed World Vegan Month or how you celebrated a compassionate festive season – email volunteer@vegansociety.com. Winterfest wonderland Leeds Winterfest took place in November, featuring many stallholders selling ethical seasonal gifts. Vegan Society member Philippa Lennox ran a beautifully-presented Vegan Society stall. She spoke to visitors about the work of The Vegan Society and signed up many people to the Vegan Pledge and our newsletter. Thank you Philippa for managing such a lovely stall on behalf of The Vegan Society! VEG Edinburgh The VEG Edinburgh group had a great World Vegan Day, handing out Vegan Society leaflets in the busy area of Princes Street and St Andrews Square before going out for lunchtime pizza. After this, those of the group who still had room visited a new vegan diner in South Queensferry. This sounds like the perfect way to spend World Vegan Day – good outreach, good company and good food. 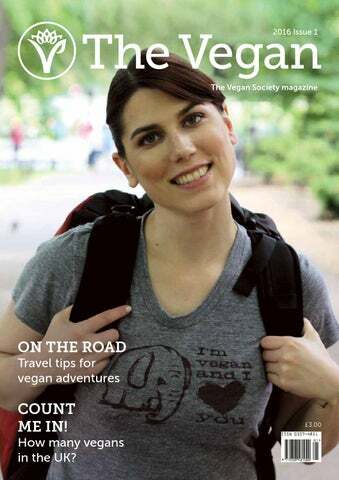 more about the magazine, visit the website – vegansustainabilitymagazine.wordpress.com. Bronwyn has also managed two information tables around Cork over the last year, one at the university and the other in the city centre, where she distributed leaflets and spoke to a variety of people about veganism. Student outreach Autumn is the season for freshers fairs and university welcome weeks, and lots of veg*n societies took this opportunity to do some great vegan outreach. Rebecca at Queen Mary University of London is president of one of these societies, and got in touch with us to request some resources. Rebecca was glad to be able to hand out our leaflets on the arguments for going vegan, vegan nutrition, and a range of recipe cards. Rebecca says that people are always keen on recipes – this can be a great way to introduce people to the concept of fantastic vegan food. Amy Pease, who is VegSoc president at the University of York, took part in York’s freshers fair. The group signed up three times as many new members as they had done the year before. This shows a great surge of interest, and means that the group is now bigger and better than ever. Amy and VegSoc organised a campaign for World Vegan Month, signing people up to the Vegan Pledge throughout the whole of November. Thank you for this great work Amy! The group are going to keep their campaigns running into next year, with plans to introduce people to Veganuary. If you’d like to hand out our leaflets at your university event or for any other outreach, please email leaflets@vegansociety.com. 1 Our wonderful events volunteers are always friendly and welcoming 2 Get in touch if you would like to help us distribute our leaflets 3 We’re always excited to hear about grassroots vegan publications! in Canterbury and Martin in Devon also displayed our leaflets and gave out information to people at the Kent Vegan Festival and the Exeter Green Fair. Thank you all so much for your help – without you it wouldn’t be possible to share our message with so many people. I’m currently planning our 2016 events calendar, so get in touch with which ones you’d like to see The Vegan Society attend. Or, even better, let me know if you’d like to run a stall for us! Email volunteer@vegansociety.com. Empowering families Independent Socio-economical movement, NESEHNUTÍ, based in Brno in the Czech Republic, applied for a Vegan Society grant in 2014 and recently completed their project. Their aim was to empower vegan families to spread veganism among their friends and other family members and within their local communities, with the desired outcome of veganism being more widely accepted in these communities and in Czech society more generally. This was achieved by organizing events, including group cooking for vegan parents. Organiser Kristýna Pešákova said the parents’ evenings were very amicable. She mentioned one particular occasion when a new vegan family joined and shared their story of how their daughter’s veganism spread to the whole family. This sounds like a really worthwhile project – well done NESEHNUTÍ! vegans in and around Cumbria (Cumbria Vegans) late last year and we’ve grown to around 90 members. We organise meet-ups, and share information on great places to eat in Cumbria, new vegan products and general veganrelated news. Vegans can also make great walking billboards, so you can usually find me wearing something with a vegan or animal rights message on it, whether it’s my Vegan Runners vest or the activist’s favourite black “Vegan. Compassion. Non-violence” T-shirt. That one gets the most questions asked as it’s a bold design and has a tonne of info on the back. Perfect when standing in a queue. What are your tips for talking to new people about veganism? The best tip I can offer is to be very knowledgeable about all aspects of veganism, because then you can give advice on the health, animal rights and environmental sides of the vegan way of life. You can also defend your position well in any discussion. Oh and of course be positive and friendly, and recommend useful websites or documentaries. What would you say to others who want to help progress the vegan movement? Join or start a group for your local area, meet other vegans and inspire each other to make changes in your own areas – at work, at school, at a local cafe, for example. Just get out there – run with a Vegan Runners vest, cycle with a Team Vegan jersey, cover your bike or laptop with animal rights stickers, make an Instagram account, or if you’re comfortable on camera then get on YouTube. Be a great representative for veganism – attraction-activism is very powerful. Who cares about older vegans and vegetarians? Discount card Want to advertise here? Contact advertising@vegansociety.com for more information. save 35% off these Veganicity favourites Glucosamine + MSM: combining Glucosamine and MSM for a superb all-round joint support formula. Vitamin K2: a fat soluble vitamin that is essential for proper bone formation and blood clotting. Multi Vitamin + Mineral: our most popular product, combining all the essential daily vitamins and minerals in one handy tablet. The holder of this card is entitled to a variety of great discounts at participating businesses. Strength in numbers How many vegans are there in the UK? of how many vegans there are in the UK we will be able to influence government, business and non-vegans. The project is being led by our own researchers, Dr Terri Holloway and Dr Lorna MarquèsBrocksopp, who are working with our Research Advisory Committee and specialist advisors from several research survey organisations. We want our survey to capture the most accurate picture possible, so we will be using the large sample size of 10,000 people, and using a face-toface interview method to ensure no groups are excluded. Our estimates indicate that it would take a sample of at least 50,000 people to target those who follow a vegan lifestyle, so we will concentrate this project on identifying those individuals who follow a vegan diet. When will we have our answer? At the end of last year we began a campaign to pay for a survey to count the number of vegans in the UK. We asked for help online using a JustGiving crowdfunder and were really pleased with the result. We have also received two large donations, which have enabled us to go ahead and commission the survey. oday’s vegan experience is very different to how it was 30 years ago. However, while we celebrate the modern culinary strides for vegans, it is also important to go back to basics when it comes to incorporating fruit and vegetables into your everyday meals. The good news is that it is much easier to meet fruit and veg recommendations on a vegan diet. Nonetheless, it’s still good practice to incorporate proper planning to ensure that your diet is full of non-processed whole foods, with processed options as an occasional treat. Here are a few tips to help you minimise your intake of processed foods. Keep fruit and veg on display In addition to serving as colourful décor, crudité trays and fruit bowls are fantastic for getting your household in the habit of snacking on healthier options throughout the day. Filling up on these strategically placed snacks will offer your loved ones the chance to indulge in tasty fruit and veg more regularly. Introduce combo meals Meat alternatives make creative options for main meals; however, when serving processed foods at home, make sure your plate is dominated by colourful vegetables. Having a ready-made veggie burger with chips can be a convenient meal option, but it would be better to replace the chips with some delicious broccoli. You’ll be left with a full tummy and the satisfaction of knowing that you’ve eaten another portion of your daily seven to ten fruit and veg recommendation. Nutritionists recommend recording at least two weekdays and one weekend day to get an accurate snapshot of your normal eating pattern. Prepare ‘fast-food’ at home Many of the most popular processed food options can be prepared at home with very little effort. It’s always a fun idea to invite friends over for a movie night when everyone helps to prepare pizzas or other commonly processed foods from scratch. Preparing food at home means that you know exactly what’s included in the meal and is a great way to avoid consuming sneaky additives. Maria Nila Stockholm Swedish salon brand Maria Nila have registered their haircare ranges with the Vegan Trademark after a longstanding commitment to making vegan, sulphate- and paraben-free products. Pure Volume gives fine hair body and structure, True Soft softens and moisturises, Luminous Colour protects colour and shine, Structure Repair repairs and strengthens and Sheer Silver helps neutralise brassy tones. Non-permanent colour pigments are also offered in a range of colour refresh masques, lasting up to ten washes and available in a variety of shades. Available from sallyexpress.com. Bathing Beauty This company first caught our eye with their beautiful bottles and simple yet elegant packaging. Handmade with natural ingredients at their workshop (aptly named The Source) in Wales, Bathing Beauty is a breath of fresh air in a world of chemical-laden cosmetic concoctions. A particular favourite of ours is Jones the Bones Muscle and Joint Oil, developed for the management of muscle and joint pain. It acts as a gentle and effective massage oil, perfect for post-exercise TLC or to reduce joint pain or aching muscles. To learn more, visit bathing-beauty.co.uk. YOGABODY New Vegan Trademark Holders YOGABODY have registered a liquid B12 supplement. Naturally sweet tasting, the B12 is easily absorbed into the system, making it an effective way to supplement a healthy vegan diet. For fans of yoga, they also produce YOGABODY Stretch, a supplement containing MSM, vitamin C and trace minerals. MSM has been shown to relieve inflammation and reduce recovery time. Buffered vitamin C, when combined with MSM, has been shown to aid in the health of connective tissues. Read more about these products at yogabody.com. The Coconut Company Recently registered with the Vegan Trademark, The Coconut Company’s coconut milk powder is a hassle-free way to add a tropical taste to any meal, bake, drink or shake. Simply mix 1-2 tablespoons of the powder in a cup of warm water and stir to form a rich instant coconut milk or cream. Produced from freshly-squeezed coconut milk, the dairy and gluten-free powder doesn’t contain lactose stabilisers like many other brands, and is much more versatile than canned coconut milk. To read more and see the entire range, visit thecoconutcompany.co. Bod’s Natural Products Another new Vegan Trademark holder, Bod’s Natural Products, have launched a range of foods and high quality natural health supplements. Moringa Oleifera teabags, created using rich moringa leaves, are high in vitamin C, calcium, potassium, vitamin A and iron, making them a great addition to a healthy vegan diet. Free from additives or preservatives, Bod’s Natural Products range are made from natural ingredients and sourced from specially selected farms around the globe, and are available to buy from Amazon and Ebay. For more information, visit bodsnaturalproducts.com. On 14 November, very sadly we lost our good friend Mary Bryniak. I had the honour and privilege of officiating at her funeral – she was a dear friend of ours. Mary was born in 1924. She was eight years old when, much to her delight, her parents decided that it was time they followed a vegetarian lifestyle. During the Second World War, she worked for the Land Army at a market garden in Cottingham. The experience gained there enabled her, along with her family, to create Glen Park Nurseries in Leicester. It was there that the family met Donald Watson, before the term vegan was coined. The Vegan Society’s first Newsletter records a membership of just 25 – Mary was among these founders. We will always remember Mary for being thoughtful, compassionate and kind to all other living creatures, as well as her work for the vegan cause. Mary saw the movement grow from those initial 25 members to hundreds of thousands today. 63% by films 15% by books 7% by spoken word 5% by music 4% by other non-media influences 3% by podcast 3% by animals A large percentage of the above are available online and through various social media sites. I wonder if people will look back and make any connection between the rise of social media over the last ten years and the global rise in veganism in this same period. Getting the word out there has never been more important – whether a festival, Facebook group, film screening or just by wearing a T-shirt – all will be a worthwhile success, for the animals as well as the planet. So use your channels – promote a vegan way of life as best you can. It will make a difference. The time commitment is around eight days per year for meetings and training plus about six hours a week for contact via email, post, or phone. The role is voluntary but expenses can be claimed. To be eligible for appointment you must: have been a full member of the society for a year or more by the time you are appointed; submit a written nomination signed by a proposer and seconder who are both full members; submit a personal profile; and be willing to sign the trustee code of conduct. Proposals to the AGM should: • Be proposed and seconded by full members • Not exceed 300 words, including any supporting material • Propose a single form of action (i.e. they must not be composite proposals, and must not simply comprise a statement of opinion). In accordance with a change in the articles in 2015, council will, in so far as is practicable, arrange for a counterargument of up to 150 words to be circulated with each proposal to provide members with a more complete picture when they vote. If you have any questions about becoming a trustee, wish to receive a copy of the candidates’ pack or want advice about a possible proposal, please email ceo@vegansociety.com, or contact the chair of council, Edward Daniel, at edward.daniel@edwarddaniel.com. Nominations for council and proposals must be received at the society’s office before 5:00pm on Friday 18 March. Áine’s new book begins by detailing the reasons to be vegan in a non-judgemental manner, before tackling the subject of where to begin. The section on what a vegan can eat, including restaurant eating, answers many of the questions new vegans will most certainly have. Also included is a section on addressing the inevitable questions new vegans are asked. The ideas will assist you to navigate fresh waters, and find the peace you are seeking from a vegan diet. The layout is very appealing, with a clear type setting, and attractive watercolour images of food. Images clearly show which recipes are raw or gluten-free. The food photography artfully styles each vegan creation. In addition, Áine does not limit herself to the kitchen as she also provides recipes for beauty that are kind to the skin, as well as animals. A great way to start your day is with the warmth of spice in the Indian Style Crepes filled with spicy butterbeans. Black Bean Taquitos with Enchilada Sauce is a relatively simple and quick tasty recipe for a weeknight and great for sharing. But the star of The New Vegan surely must belong to the Aduki Bean Casserole, bursting with a myriad of flavours. The richness of miso and marmite gives depth to the dish, and the addition of coconut milk adds just the right amount of creaminess. With straightforward recipes and useful tips, The New Vegan is a simple beginner’s guide, with recipes for anyone starting out on their new journey. For those of you not in the know, a spiralizer is a kitchen tool most commonly used for turning vegetables into noodle shapes. Spiralizers are great for people looking to incorporate more veggies into their diets, minus the faff of endless slicing, peeling and chopping. They’re also ridiculously fun to use, and feel slightly like a child’s play-doh fun factory. I recently entered the spiralizer club as I was given one for my birthday. Although the initial excitement of making huge salads with endless courgette noodles took a while to wear off, I was definitely ready to try some new ideas. Spiralize! was just the book I needed, including plenty of options for breakfasts, snacks, sweets, soups and side dishes. Spiralizers can be used to prepare fruits and vegetables for a number of different uses. These include noodling carrots to be baked in muffins, and finely cutting potatoes or sweet potatoes into slices or spirals for baking into crisps. The very simple Baked Veggie Chips recipe works a treat, and is so much easier than trying to finely cut vegetables into equal slices. The book also includes recipes which incorporate fruit – try out the Fruit-filled Oat Waffles made with spiralized apple, or the Pear and Cranberry Crisp Dessert. The variety, creativity and flair of the recipes make up for the book’s plain aesthetic, coupled with the added bonus that most recipes use everyday, easily accessible ingredients. So why not hop on the spiralizer bandwagon – everything is better when it’s noodle-shaped.